"Trinder, Constable and McKellan were 1951 vintage, but dropped a form because of absence or academic reasons. 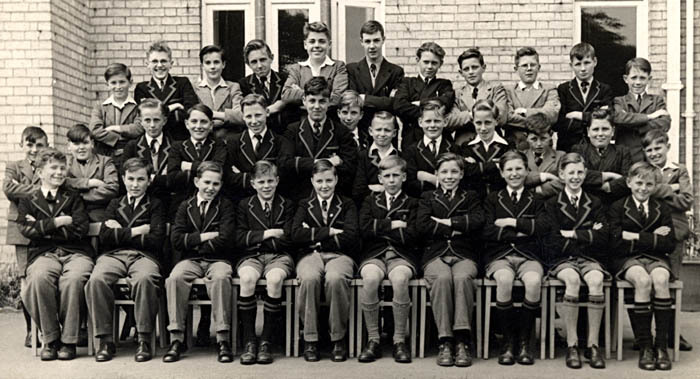 The rest were 1952, except for Boyce who joined 1954 from another school, and Edwards, who joined from Leatherhead ( which he pronounced Leveread, to the confusion of all). An anecdote concerning Gordon Jackson (a most prolific goal-scorer on the football field). By the 5th form, he had a bushy quiff of extremely thick hair, and like all of us, wore his school cap on the back of his head, to the point of it being invisible. Error-prone Charlie Ford reprimanded Gordon on one occasion, saying "Where's your cap, Jackson?" - "On my head, sir", replied Gordon, causing peals of laughter from us all, much to red-faced Charlie's embarassment. How's that for memory?" Just a few first names needed.